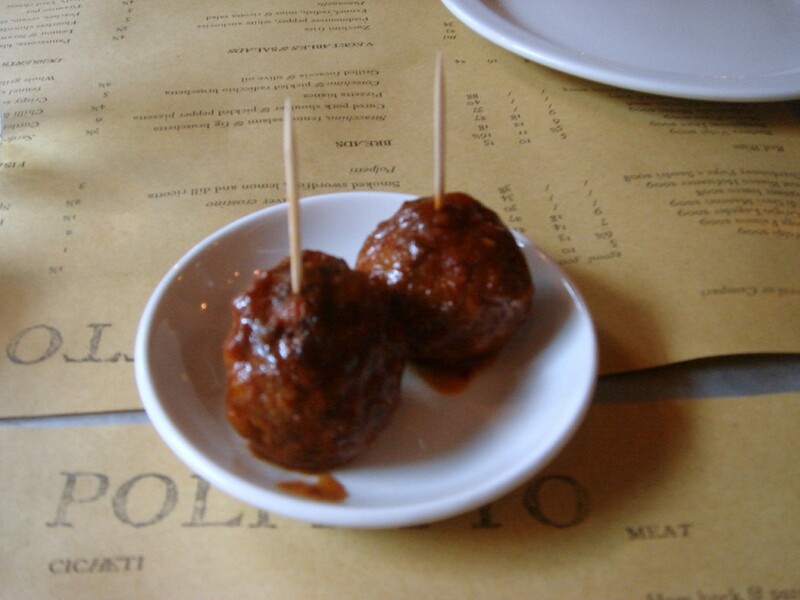 Having recently gone to Polpo and enjoyed it, I couldn’t wait to try its recently opened sister restaurant, Polpetto. Perched on top of the legendary Soho pub, The French House, it is a tiny imitation of its bigger sister. Not only is the dining room smaller, the décor, with its hole in the wall look, is more subdued and relaxed. Unlike Polpo, Polpetto doesn’t come with its own bar area, so I can only guess that those waiting for tables must do so in the pub downstairs. 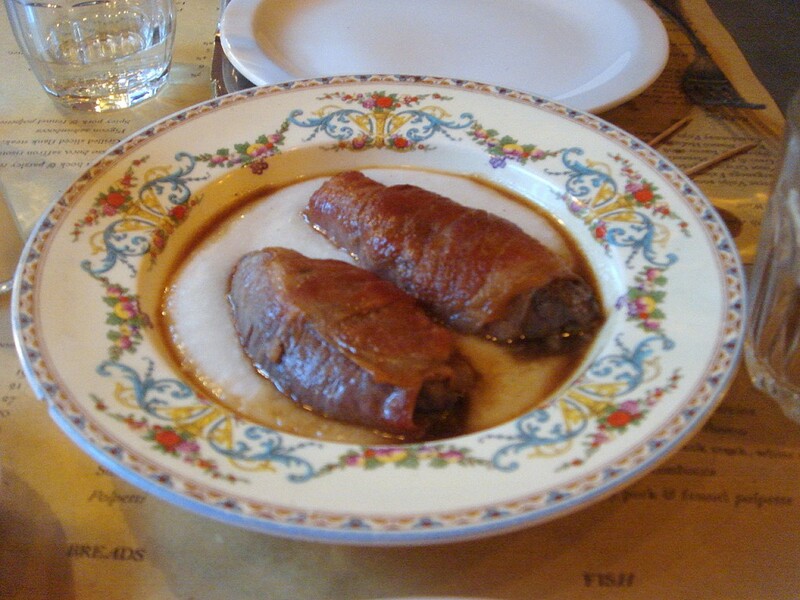 The menu is similarly designed to Polpo’s – barcaro type eating at reasonable prices. We started with several items from the cicheti (small bites) section. Our first choice was the duck and porcini meatballs (£1.50 each) which were divine. Packed full of rich duck and porcini flavour, the only slight drawback was that I got too much black pepper in one particular mouthful as the seasoning hadn’t been evenly dispersed throughout the meat. The meatballs came out piping hot – so hot in fact that it made me wonder if they had been microwaved before serving. Melanzane parmigiana (£2 each), aubergine rolled and filled with parmesan was tasty, if a touch salty. Polpetti (£3), a baby octopus taster was delightful. The octopus was firm with a touch of springiness to the flesh, and lovingly dressed with olive oil and garlic. 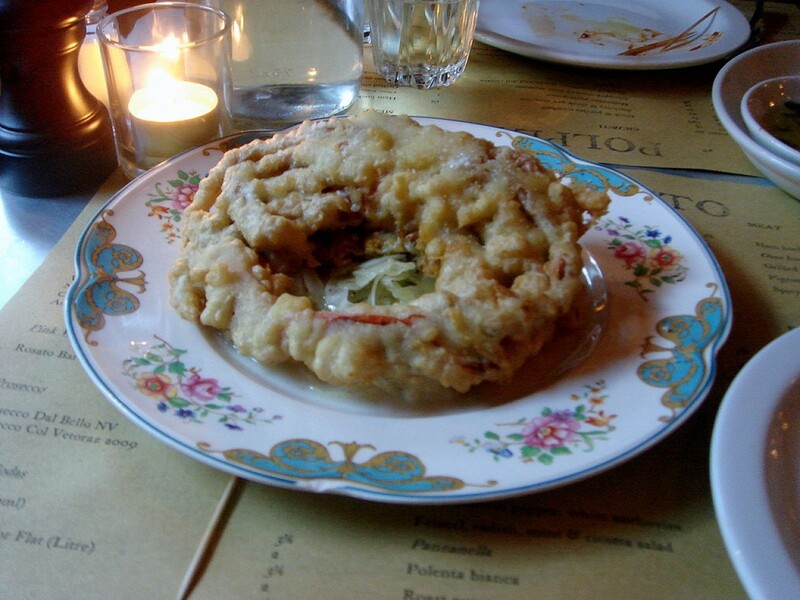 Crispy soft shell crab with a parmesan batter and fennel salad (£8) was a disaster. The batter was soggy as if it had been pre-cooked and left to sit. And without the requisite crispiness of a good batter, the crab was unpalatable like a clammy mess. 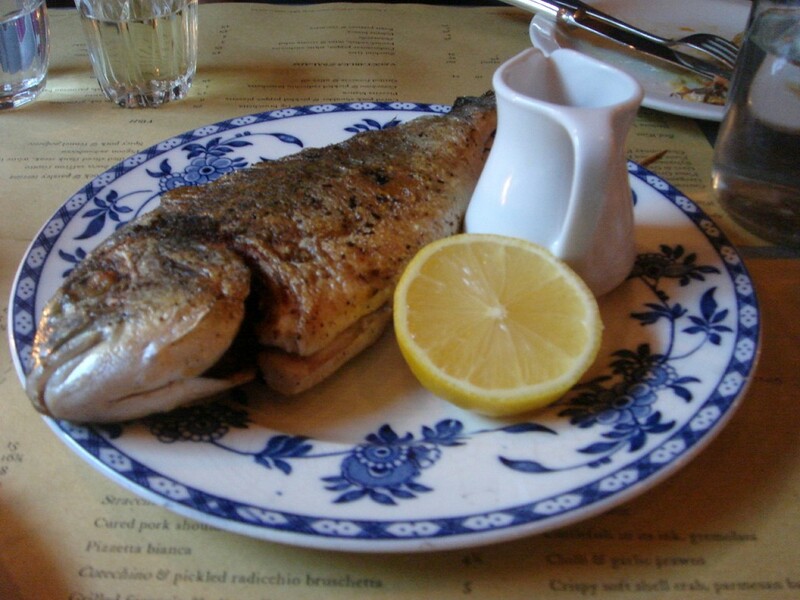 Whole grilled sea bream at £12.50 was an amazing bargain. Generously sized and very fresh, the fish was well cooked, leaving it moist and succulent. I lapped this up with fervour. 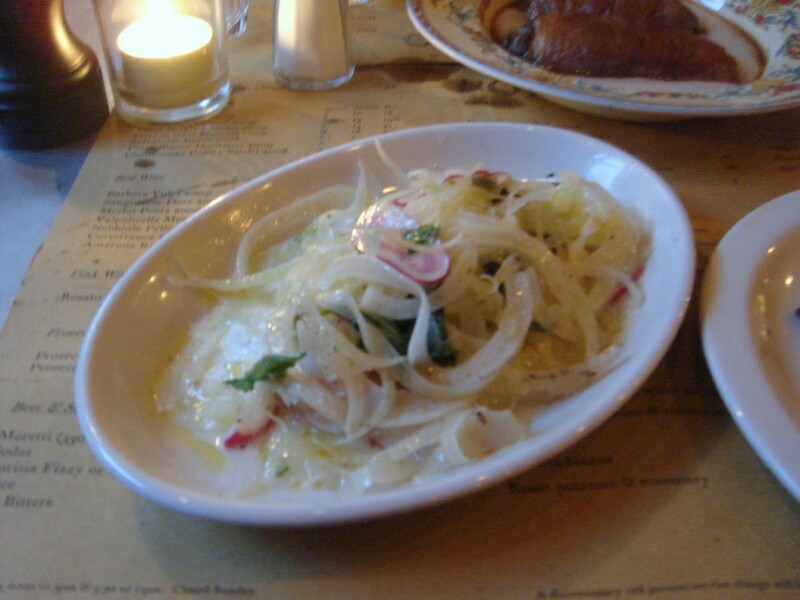 Fennel, radish, mint and ricotta salad (£5) was extremely salty. If there was mint in it, I couldn’t taste it, probably because of the over seasoning. The ingredients were very fresh, but dressing was slightly runny which gave the dish an appearance of a soggy concoction. This salad had been carelessly prepared. Pigeon saltimbocca (£7) was extremely difficult to cut. I ended up asking for a steak knife, but the restaurant didn’t have any, so I got a work out on my arm. But surprisingly, the pigeon, wrapped with sage in prosciutto, wasn’t as tough or chewy as the exercise of cutting it would suggest. However a little less cooking time would have yielded a moister flesh and greater tenderness. It had good flavour, but the sage gave the meat bouts of bitterness. The accompanying polenta was tasty and creamy but a little runny. 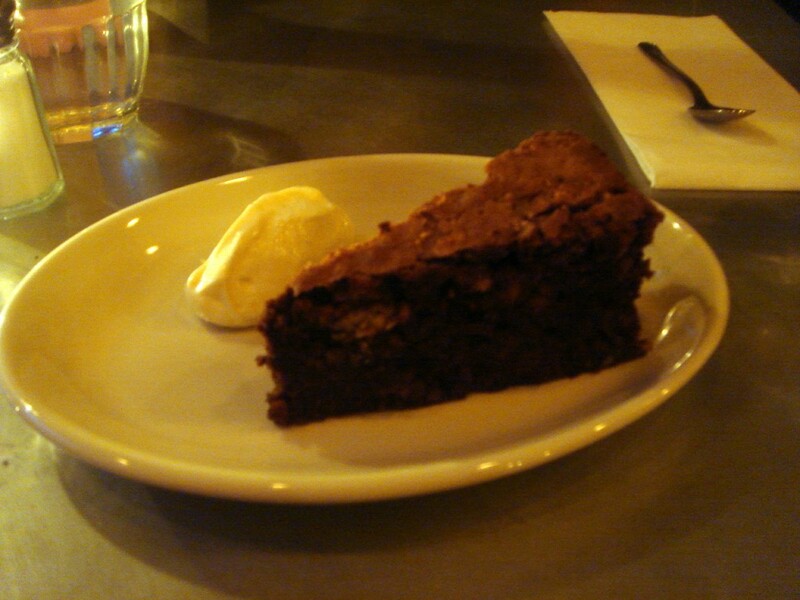 For dessert, we went for the flourless chocolate and hazelnut cake (£5). I tried the flourless orange and almond cake at Polpo which was superb, and I had high expectations of this version. It did not disappoint. Light, airy and moist, with a rich chocolate flavour, this cake was to die for. The people behind Polpo and Polpetto truly know how to bake flourless cakes. The service was attentive and charming, better than at Polpo. But this is a smaller room, and the pace of the dinner sitting felt less frantic. This was a mixed bag of goodies. Where the food was good, it was truly excellent. But there were also bouts of unevenness and carelessness in the cooking, not to mention a dire soft shell crab. However the prices are very reasonable, so even if some of the food isn’t quite up to scratch, you don’t feel like you are being stung. If know your favourites, Polpetto is worth a second visit just for those. For me, the meatballs, the fish and the chocolate cake were second to none, but on the whole, I preferred the food at Polpo just a little bit more. The osso bucco was my favourite Polpetto dish – divine. Sooo if I had a choice between polpo and polpetto, which would you choose? Tempted to go to both, so which order? 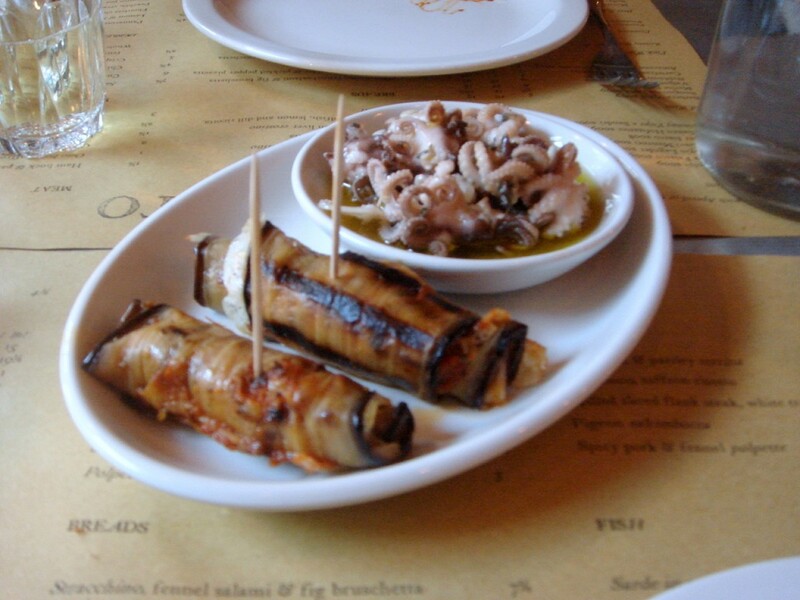 Overall, I preferred the food at Polpo better. It was more consistent and there were less mistakes. The atmosphere was more chilled out at Polpetto, but I think if I had to choose, I would choose food over atmosphere, so Polpo. ha ha, your are right. I have made the change. Thanks so much!